In this episode, Luvvie is feeling good about all the love in her new social network called LuvvNation! She rants about doing our due diligence in business, and she spotlights Divine Flavor Catering, her favorite Nigerian food restaurant. She then chats with Marsai Martin, the youngest Executive Producer in Hollywood history. In this episode, Luvvie is feeling good about all the love she got from an international contingent during her Dublin trip to Keynote “Creating Authentic Brand Stories” at the ICF Headquarters (International Coach Federation) as well as how being on that stage validated her work. She rants about archaic, annoying voicemail and how getting rid of it was one of the top things she’s done for self-care in 2019. And she spotlights Tiffany “The Budgetnista” Aliche, a true leader whose mission to help women make better financial decisions is aspirational and accessible. Then, Luvvie kicks it with VSB’s (Very Smart Brothas) Damon Young about life, words and his new book, What Doesn’t Kill You Makes You Blacker: A Memoir in Essays. In this episode, Luvvie is feeling good about her Paris trip (and engagement! ), rants about people who send nonsensical emails and DMs, and shows love to The Crayon Case. She also chats with Carol’s Daughter Founder and President Lisa Price about little known facts about her, like going to college at 16 and working on The Cosby Show. She also goes through her journey creating the pioneering brand in natural hair care. In this special episode, Luvvie brings you an in-depth interview with Sundial Brands Co-Founder and CEO Rich Dennis. In the interview, Rich shares how he went from selling soaps on 125th street in Harlem to building a business that is now a global conglomerate. He chats about why economic freedom is so critical for the Black community and breaks down the costs of (not) buying Black. He talks about buying ESSENCE Magazine and explains how he had the conviction to insist that Unilever invest $100 million in Black women entrepreneurs as part of this partnership with the megabrand. Last but certainly not least, Rich addresses the controversy surrounding that SheaMoisture ad and whether the formula has changed. Yea, we went there! Do yourself a favor and get into this episode ASAP! In this episode, Luvvie is feeling good about the LuvvFest her friends threw her just because, rants about people who do not vote, and shows love to Mess in a Bottle. She also chats with sports journalist, commentator, and producer Jemele Hill. In this episode, Luvvie is feeling good about the little black girl magic going to the pool and being mistaken for a 22 year old, rants about the Presidential Alert, and shows love to the book “For Colored Girls Who Have Considered Politics”. There’s also a special guest segment where Luvvie chats with none other than Kale. She also talks with artist and author Dami Lee of As Per Usual and Be Everything at Once. In this episode, Luvvie is feeling good about the new movie “Bad Times at the El Royale” and the upcoming Together Live tour, rants about the craziness of the Brett Kavanaugh hearings and why we need to BELIEVE WOMEN, and shows love to the wonders of Vitamin C serums. She also talks with actress and producer Ashley Blaine Featherson of Dear White People. In this episode, Luvvie is feeling good about purging her home of old stuff, rants about the hateration against Queen Serena Williams, gives love to Black Girls Rock!, and chats with author, activist, and auteur Darnell Moore about his radical love for Black people and new book, No Ashes in the Fire! In this episode, Luvvie is feeling good about Andrew Gillum’s historic win in Florida, rants about overrated foods, gives love to the Dream Village, and chats with celebrity hairstylist and natural hair expert Felicia Leatherwood about her mission to help us love our hair and ourselves! In this episode, Luvvie is feeling good about her new reel and your heartfelt reactions to her work, rants on why Reply All is the devil, gives love to the DF Nigerian Food Truck in New York, and chats with actor, comedian, and social media influencer KevOnStage about making digital comedy and why being himself is his key to success. In this episode, Luvvie is feeling good about her well-deserved vacation, rants on not feeling guilty about outsourcing her life, gives love to Beyonce and the On the Run II Tour, and chats with champion fencer, author, and fashion designer Ibtihaj Muhammad about becoming the first Muslim woman to win an Olympic medal for the United States and having both a Barbie and Nike line created in her honor. SURPRISE! You know we couldn’t stay away from y’all too long so we dropped a bonus episode! In this special episode, Luvvie answers YOUR questions on winning at work whether you’re in a 9-to-5, working on side hustles, or launching a business of your own. She shares why pricing correctly for your work is so important, the joys and pains of going independent, how to survive a job you hate, and more! In this special crossover episode with Small Doses with Amanda Seales, Luvvie is feeling good about her Afrobeats playlist, rants about the high road being overrated, gives love to Chicago Recording Company, and chats with the multi-talented Amanda Seales of HBO’s Insecure and Smart, Funny, and Black about making her own path as a multi-hyphenate and how she keeps it all the way 100 online and in real life. In this episode, Luvvie is feeling good about working out, rants about Trump’s policy separating children from their families, gives love to the National Museum of African American History and Culture aka the Blacksonian, and chats with corporate badass Bozoma “Boz” Saint John about the career she was supposed to have, being authentically herself and her recent decision to leave Uber to become Chief Marketing Officer at Endeavor. SURPRISE! We drop a bonus episode because Luvvie loves y’all that much! In this special ep, Luvvie gets real about the good, the bad, and the ugly when it comes to friendship. She shares why you should side eye people who don’t have any long-term friends, how to make sure you’re not a draining one, and when it’s time to call it quits. In this episode, Luvvie feels good about her Afrobeats playlist and the internet’s petty clapbacks at racists, rants about why social media should not make you doubt your journey, shows love to the Black Women in Politics database, and talks with Jussie Smollett of the hit TV show Empire about growing up in show business and his new album Sum of My Music. In this episode, Luvvie talks about a fan who shot his shot correctly, rants about Kanye’s fact-free thinking, shows love to the multi-layered “This is America” music video from Donald Glover (aka Childish Gambino), and talks with Franchesca Ramsey of MTV’s Decoded about her new book “Well, That Escalated Quickly: Memoirs and Mistakes of an Accidental Activist”. In this episode, Luvvie talks about her first solo magazine cover, rants about the royal womb, shows love to the book she reads every year, and talks with Necole Kane of xoNecole.com. 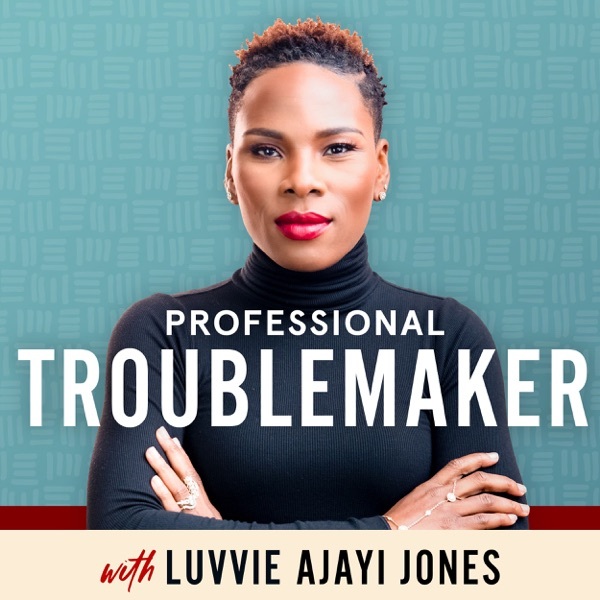 In this episode, Luvvie shares a story about her teenage nephew and how he’s impressed by what she does. She rants about how she would rather ride a goat than fly Spirit Airlines. She spotlights Will Smith’s Instagram and interviews her good friend Abiola Oke, CEO of OkayAfrica. In this episode, Luvvie talks about March for Our Lives, rants about how she was given Diet Coke instead of a Coke by a couthless waiter. She also shows love to the show Black-ish, and talks with the incomparable Jenifer Lewis! In this episode, I talk about 2-year-old Parker Curry and her adorable moment with Michelle Obama, rant about how much I hate texting (because I'm YoungOld), show love to ESSENCE Magazine, and talk with ESSENCE’s Editor-in-chief, Vanessa K. De Luca. In episode 2 of Rants and Randomness, I talk about a magical moment I recently experienced with one of my favorite icons (Cicely Tyson), rant about people's entitlement to our platforms, show love to one of my favorite books EVER, and chat with a true BAWSE I know: Myleik Teele. In the first episode of Rants and Randomness, I have a feel good story, rant about Valentine's Day extraness, LOSE MY MIND over the Black Panther movie, and interview one of my favorite people, Eunique Jones Gibson. Rants and Randomness covers all things pop culture and relevant to our lives, through the lens of our resident Side-Eye Sorceress, Luvvie Ajayi. There will be judgment, but lovingly. There will be shade, but that's necessary sometimes. There will be (of course) rants, because why not? And there will be special guests: people you already know and love and people you need to know.